This Jacobean Camino involves the most kilometres on Galician soil and offers walkers the largest number of variant routes. Through the province of Ourense there are two possible routes, one that goes through Laza and another via Verín. This last route, of natural beauty and heritage value, is not widely known among pilgrims despite it passing on ancient Roman roads. These Roman roads that pass through the Iberian peninsular were the origin and base of this long route that begins at the door of the cathedral of Seville. The itinerary heads northwards, via Extremadura and connects to Castile in Salamanca and Zamora to later turn in the direction of Galicia and, ultimately, to Santiago of Compostela. The roots of the itinerary can be traced back to before the discovery of the body of the apostle in the IX century. At the beginning of the Christian era the Roman Empire took advantage of the old Caminos to construct great roads, like that, which connects Emerita (Merida) to Asturica (Astorga), the origins of the current route. In the early middle ages the route remained active, providing passage to Arabs on their journey north. It is here that the name of the Camino derives, not because of its relationship with the trade of silver but rather because the name comes from the Arab term Bal’latta, the name given to the wide cobbled roads by Muslims. At the end of the Middle Ages the Camino reached its peak of Jacobean splendour, following a return to Christianity of this area by the Mozarabics – alternative names for this Jacobean route are; the Southern Camino and the Mozarabic Camino- and with the recovery of these armies, during the reign of Fernando III, also to the regaining of power of emblematic locations such as Seville and Cordoba. The event of returning the bells to the cathedral of Santiago de Compostela- the same bells that were stolen by Almanzor in the X century and carried, by force, on the shoulders of Christian prisoners- would have occurred on this Silver route. This symbolic act served as justification for the massive pilgrimage from Andalucía and Extremadura that took place from the year 1250. The Christian walkers began their route either, through Astorga, on the French Camino or they would deviate beforehand, in Puebla de Sanabria, towards Galicia and shorten the route. From this shorter alternative Camino another name for the route derives, that of Camino Sanabrés. 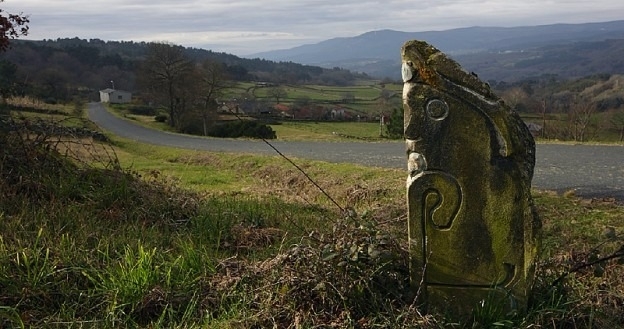 In Galicia the length of the Roman road that connects Merida to Astorga and which later heads towards Compostela is known as the southeast Camino. It has many alternative routes and two means of accessing Galicia. The most frequently used is that which comes from Castile and passes through A Gudiña. However, for those pilgrims coming from the north east of Portugal the best option is to head to Verín. From A Gudiña two very different routes depart. One goes to the north towards Laza, via Verea Vella (the route taken by Gallegos working the fields of Castile) and arrives in Xunqueira de Ambia. The other goes south, towards Verin, Xinzo and Allariz. The main differences between the two are the kilometres covered (214 km via Laza and 233 via Verin) and, the number of pilgrims, with more choosing to pass through Laza. In both cases there are rocky climbs, too much asphalt but also locations of great heritage value. Both routes unite before reaching Ourense and, together travel to Cea, from where new alternative routes depart. The most frequently used is that which goes via the monastery of Oseira, Deza and Ponte Ulla. Entering Santiago via the south on the old medieval road. Nowadays Currently there are many reasons why pilgrims would want to choose this route, for its beauty, tranquillity and, because it is unlikely to become overcrowded. The worst aspects of this Camino are the high temperatures reached in summer in Ourense- the frying pan of Galicia-and the solitude. For this reason the most appropriate times to go are during the months of May, June, September and October. Other disadvantages include the lack of albergues on route, resulting in pilgrims having to cover too many kilometres in one day and, in some stretches, a lack of signposts. Hola soy Miguel, quiero hacer el camino desde Sevilla. Alguien me puede enviar información? Es para mediados de octubre gracias. Voy con la ayuda de una vici pues tengo una minusvalia de espalda y no creo que pueda cargar tanto peso y tanto tiempo, me lo tomaré con tranquilidad llevaré mi tienda de campaña ⛺️, ya que hay podré llevar algo más de peso. Hola Miguel.En Sevilla capital también tenéis una asociación de Amigos del Camino. Búscalos por internet: seguro que te ayudarán de 1.000 maravillas.Buen camino! Hice este camino de 13 a 17 de julio desde Ourense. Mucho calor. Poucas fuentes con agua propia para abastecer agua. Ourense-Cea duro mas muy bonito.Castro Dozon fue una desilusión de apoyo al peregrino de tiendas y restaurants, no hay nada. De Castro Dozon hasta Botos, caminamos horas sin una tienda para comer y beber. Silleda - Ponte de Ulla, la llegada fue durissima y surrealista porque mismo con reserva en la pensión Cruceiro, cerro as las 16h, y todos los peregrinos en esta etapa no tuvieron allí alojamiento. El albergue de distancia está lejos y aislado, sin nada. Perto de Santiago, un señor que estaba regando su jardín me negó un poco de agua. Le pregunté si era por no ser propia para beber, pero me dijo que no, que la necesitaba! Increíble! Pero conocí a personas amables y hice amigos para la vida. He visto muchas cosas hermosas. Hola, Cátia! ¿Es importante entrenar para el camino? ¿Cuánto tiempo debo entrenar? De todos los caminos que he hecho el que recuerdo con más añoranza, por su belleza, por su paz, por su espiritualidad. En este camino no dejéis de compartir la hospitalidad de los monjes del Monasterio de Oseira.